Melvyn Bragg and his guests discuss the medieval philosopher and theologian John Wyclif and his followers, the Lollards. 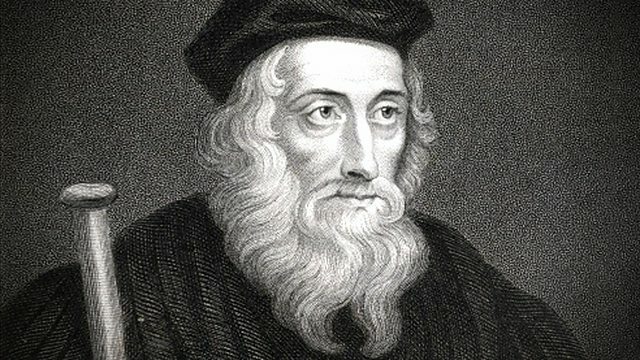 Melvyn Bragg and his guests discuss John Wyclif and the Lollards.John Wyclif was a medieval philosopher and theologian who in the fourteenth century instigated the first complete English translation of the Bible. One of the most important thinkers of the Middle Ages, he also led a movement of opposition to the Roman Church and its institutions which has come to be seen as a precursor to the Reformation. Wyclif disputed some of the key teachings of the Church, including the doctrine of transubstantiation. His followers, the Lollards, were later seen as dangerous heretics, and in the fifteenth century many of them were burnt at the stake. Today Lollardy is seen as the first significant movement of dissent against the Church in England.With:Sir Anthony KennyPhilosopher and former Master of Balliol College, OxfordAnne HudsonEmeritus Professor of Medieval English at the University of OxfordRob LuttonLecturer in Medieval History at the University of NottinghamProducer: Thomas Morris. Browse the Medieval era within the In Our Time archive.